Our latest Summer Promotional Watches for Company Gifts is absolutely ideal for the summer to gain some brand name awareness during the summer sun. 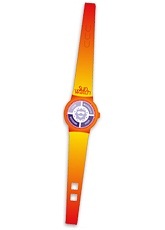 Great either for adults or kids - the promotional sun watch will monitor the sun's harmful rays and indicate whether you should be using protection or whether it's safe without. Ideal to post to customers and clients along with an invoice or hand out at business conventions - the personalised logo branding area is more than suitable to gain some good old fashioned publicity. Order some Summer Promotional Watches for Company Gifts and join in the fun! For a FREE QUOTE, please fill in the form regarding our Summer Promotional Watches for Company Gifts and we'll be able to help you.